Autumn is here. Leaves are changing. There is a chill in the air. And, most important, Halloween is around the corner! Whether you have young children or not, Halloween is a staple holiday in American culture. We love to dress up in scary and creative costumes, but what love even more is dressing up our homes to show our holiday spirit (pun totally intended). Unfortunately, just like any other holiday, Halloween has become a time of year for corporations and retailers to leverage profits. Costumes and decor are no longer cheap, and so many Halloween enthusiasts are turning to do-it-yourself style decorations. Below we’ve collated our favorite, freaky, homemade decorations. These are cheap and easy ways to spice up your front porch for trick or treaters or keep your dinner party guests on the edge of their seats. Who would have known! The recycling bin is haunted! Bottles make an aptly shaped ghost in a few quick steps. First, remove all labels and caps from the bottles. The ones in the picture are Perrier, but you can also use the single serve Poland Spring Seltzers or any brand with a more triangular shape. Once you have the bottle clean, spray paint white. Use a black sharpie for the faces and add a decorative straw for some extra holiday flair. 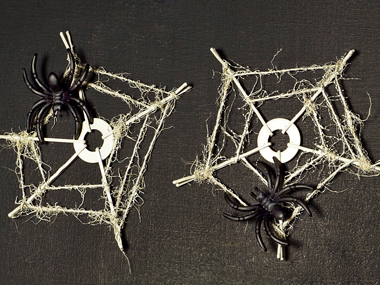 These cobweb coasters are an awesome addition to your Halloween table. All you will need are some bobby pins and a flat washer. Hook five of the pins over the washer at five, evenly spaced points. Loop around and through each pin using twine and pull taught. Finally spray paint everything with a quick burst of white to create that translucent, spider web feel. Invite you guests to dine at Dracula’s table with these blood stained, vampire fang napkins. For this, you will need some cheap white cloth napkins that you are willing to ruin. Stain them deep red using Kool-Aid. 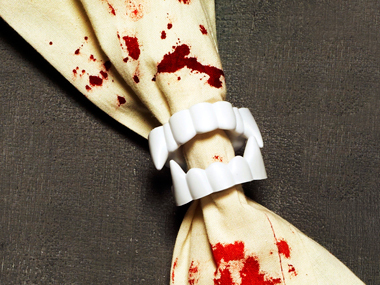 Then, using a twist tie, secure a set of plastic vampire teeth around the napkin to act as a holder. Couldn’t make it to the pumpkin patch this year? 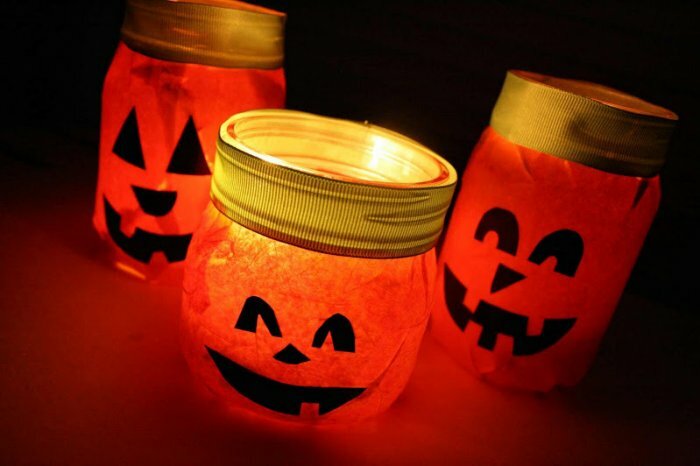 These mason jar jack-o-lanterns can stand in this Halloween. Cover clean, empty jars with orange construction paper and decorate the face as you like. Then, drop a tea candle inside the jar and let your jack-o-lantern glow. 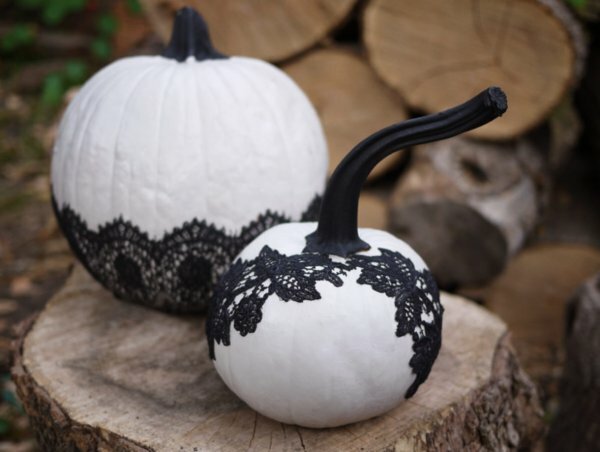 To class up your pumpkins try this: spray paint them all white (or you could always buy a white pumpkin), and wrap them with strips of lace. If you do not have access to lace fabric, you can use a headband, or strip of lace stocking to fit the widest diameter of the pumpkin. 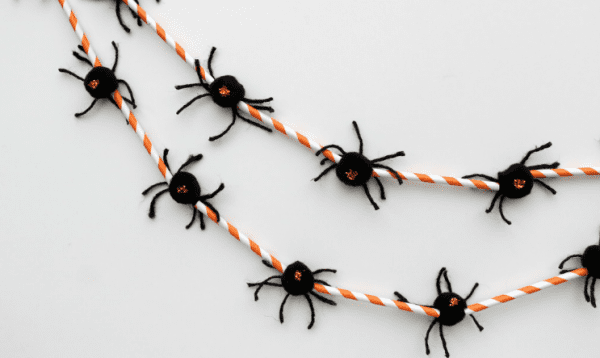 Glue black yarn onto a pom-pom to make your spiders. 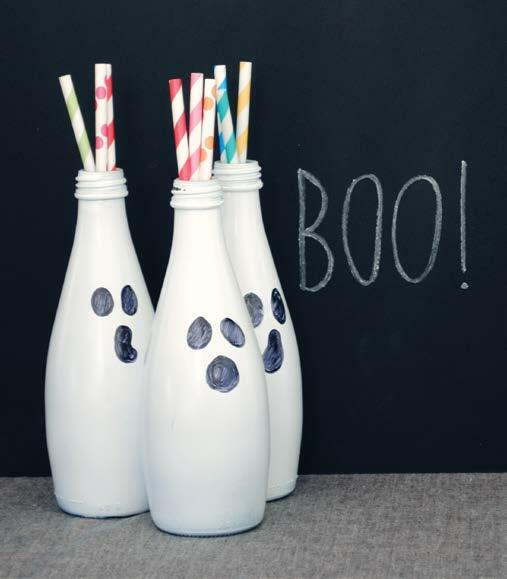 Decorate them with googly eyes or orange sparkles, then string them together along decorate, Halloween straws. 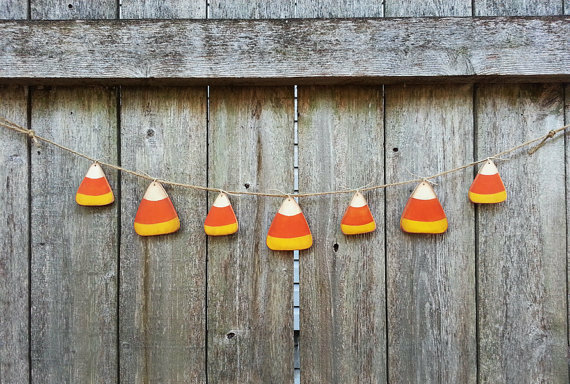 Using some orange and black ribbon, create a candy corn garland. You can use real candy corn, but they are so small. No one will see! Instead, go down to your local hardware store and grab some orange paint chips, a bunch of every shade. Cut them into candy corn shapes and punch two holes in the ends for the ribbon.